I have a number of “core” brushes that I use for work all of the time. Over the years, I have managed to add a few to that “core” number of brushes. It’s a big deal, because as an artist, you end up picking up the same brushes over and over. In time, you get to “know” the brushes that you use; what they are good at and what they are good for. My latest additions are these brushes from the Kumadori Brush Collection by Japonesque. If you are a makeup fan, you might think that these brushes are from the Kabuki Collection of Nars Cosmetics. For the sake of comparison, on first glance, the wisteria wrapped handle of the Nars Kabuki Brush Collection is shinier than that of the Japonesque Kumadori Brush Collection. There are also other subtle differences in product design like: the handle designs, the ferrule designs, and the brush head design. Go see for yourself. I have been told that Japonesque produces the Kabuki Brush Collection of Nars Cosmetics, but I could not find substantial information to know this to be 100% true. One other possibility is that, both these companies might have the same manufacturer in China. The Japonesque Kumadori Brush Collection is inspired by Kumadori. Kumadori is actually a makeup style worn by Kabuki actors who perform in the aragoto style. Aragoto is an acting style where in Kabuki actors perform using exaggerated, dynamic body movements and dramatic vocals to portray their characters. Kumadori. is described as the use colors applied in stripes or in a specific pattern over white foundation to depict the character he is playing. To read more about Kumadori read on at http://goinjapanesque.com/10660/. The Japonesque Kumadori Brush Collection is a collection of 5 brushes. All of which have a plastic handle that is wrapped in Wisteria bark. Some people might not like having a textured brush handle, but I like it. It gives me some traction, securing my grip which prevents the brush from slipping through my fingers. The brushes are very versatile. The bristles are made from natural fibers which feel very soft and very luxurious. You can use these brushes for powder, cream and liquid products. The wisteria bark, brushes handles and the bristles are dyed black. So always wash the bristles with warm water and soap before using. Don’t be alarmed by the dark dye getting flushed by the water, it eventually clears after the initial wash. The entire length of the brush is around 7.25 inches. The brush head measures at 2.10 inches starting from the ferrule to the brush tip. This is great to use when you want to have a thin veil of powder on your face. 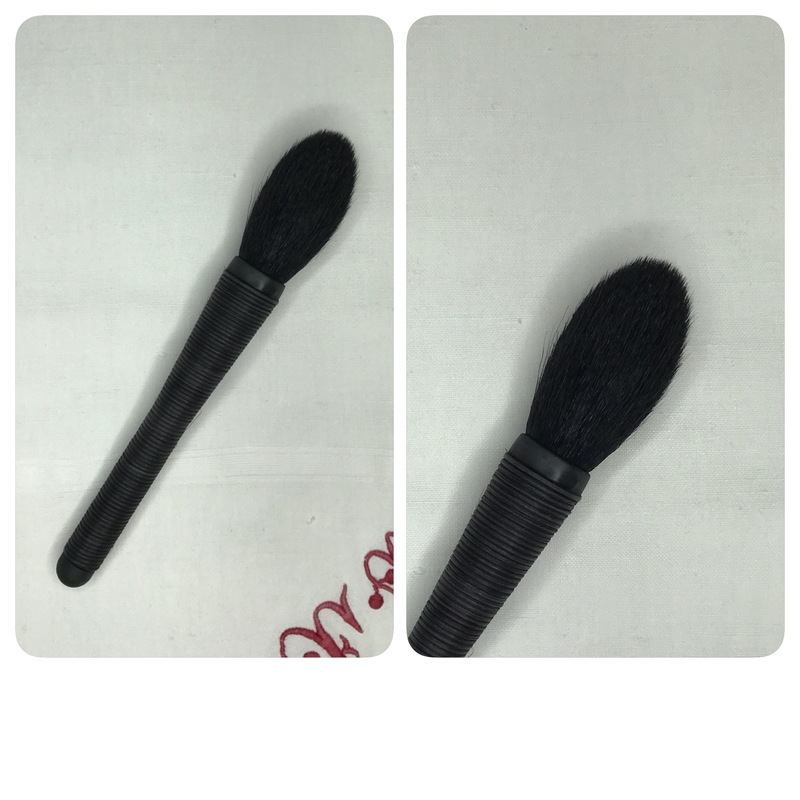 I primarily use this brush for powder applications when I want to set foundation. I also use this as finishing brush when using loose powders.There have been times I have used this for applying and blending out powder contour. 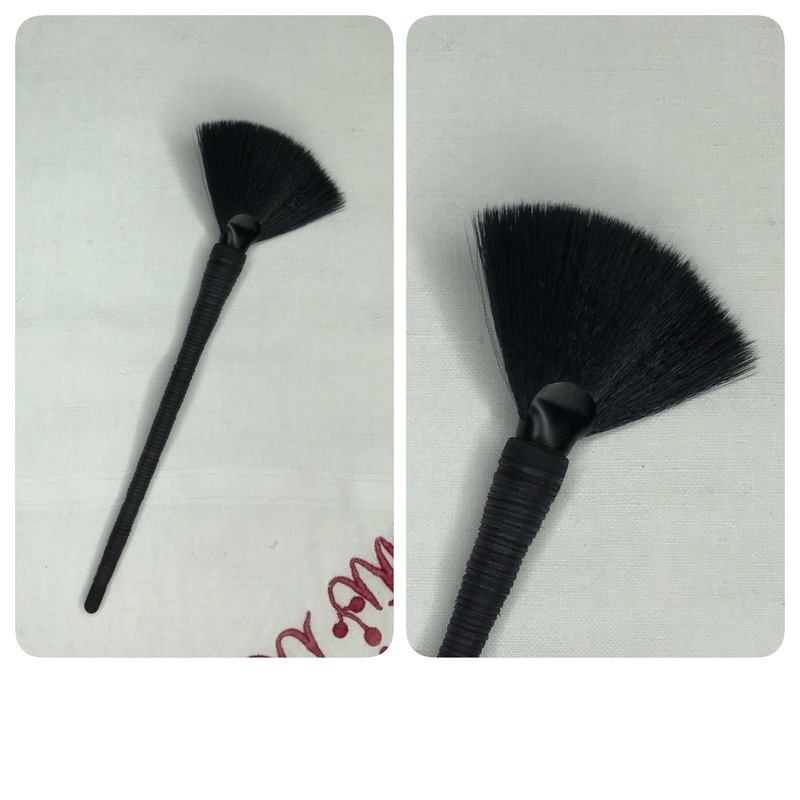 The bristles are tapered and not as compact as other powder brushes. The entire length of the brush is around 6.6 inches. The brush head measures at 1.7 inches starting from the ferrule to the brush tip. I use this brush mostly in applying bronzer. The brush head is tapered and fluffy. It picks up the right amount of color and helps me deliver it evenly on the skin. I have tried applying blush, in powder and cream formulas. As seen here, I prefer to use my Mitsuyoshi Yachiyo Brush for this purpose because the brush heads are white. This enables me to see the color of the blush, unlike the black brush heads of the Kumadori Countour/Highlighting Brush. The entire length of the brush is around 7.05 inches. The brush head measures at 1.5 inches starting from the ferrule to the brush tip. I use this brush as a secondary highlighting brush. I find the bristles too “stiff”. I had to re-train my hands in using this brush because, if one is to heavy handed, streaking happens. It’s best to use this brush with a very light hand. In terms of comparison, I prefer to use the badger Beautemps Fan Brush. The bristles are softer, less compact and it picks up a small amount of product that is perfect for layering. I bought these brushes during my trip to the US in 2016. Cholo and I were visiting our good friend Frankie in Maryland. We were walking along Downtown Silver Spring, a complex of shops, and I saw an ULTA! In the US, these brushes are only available at ULTA or at ULTA.com. Prior to arriving in the continent, I had already planned to visit an ULTA physical store to get these brushes. While I was at Los Angeles and New York, I totally forgot to visit a store. I thank serendipity for showing me to ULTA when we were on our way to the parking lot. The Kumadori Powder Brush retails for $ 28 [Php 1500 +-] (exclusive of tax). The Kumadori Fan Brush retails for $19 [Php 1000+-] (exclusive of tax). The Kumadori Contour/Highlight Brush retails for $19 [Php 1000 +-] (exclusive of tax). Check these brush out at ULTA.com. These brushes are also available here at the Philippines at the Beauty Bar. 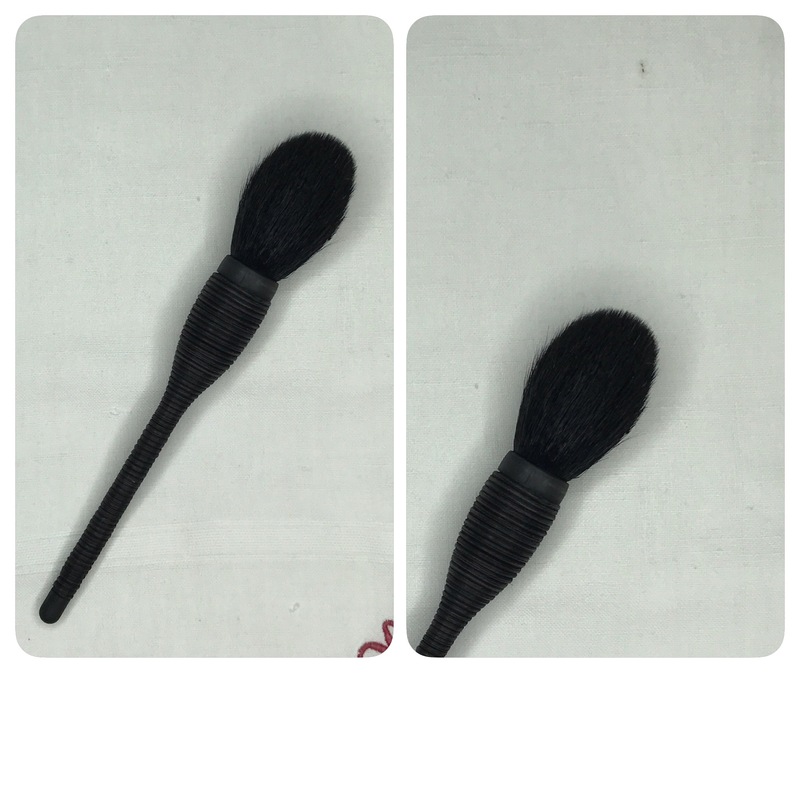 The Kumadori Powder Brush retails for Php 2095.00. The Kumadori Contour/Highlight Brush retails for Php 1395.00. The Kumadori Fan Brush retails for Php 1295.00. Check out the Kumadori Contour/Highlight Brush in action on my Red Carpet Inspired Glam Makeup Look video. This is not sponsored. The products that are shown here are the products that I always use, love and live by.